Founder Chris has been in the food and drink industry for an impressive 30 years. The desire for a healthy and low sugar drink prompted him to create Newton’s Appl Fizzics in 2014. The apple is carefully selected, so that when sparkling water is added, and the sugar content is reduced, the apple flavour remains strong. The product is gently pasteurised to preserve it in the bottle. Nothing else is added in – no sugar, no artificial ingredients, no preservatives. It is the perfect alternative to alcohol or a sugary soft drink, which is exactly what Chris had set out to achieve. 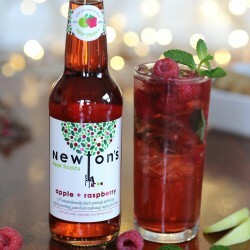 Newton’s appl fizzics is a serious soft drink for adults - all natural, curiously refreshing and about 40% lower in sugar than juice on its own! 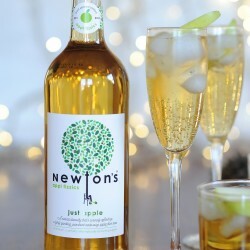 Rachel Phipps called Newton’s Appl Fizzics light and refreshing "and even if you don't have any ice to hand, it is great chilled and poured over a few mint sprigs."